The Pay Days Tab is where you create and mange all of your pay day cycles. Money Pilot uses these to group your bills by, for the Planner Tab, and enable you to quickly make transaction records into your accounts for your pay checks. At the top of the list is a horizontally scrolling list of all your pay cycles. 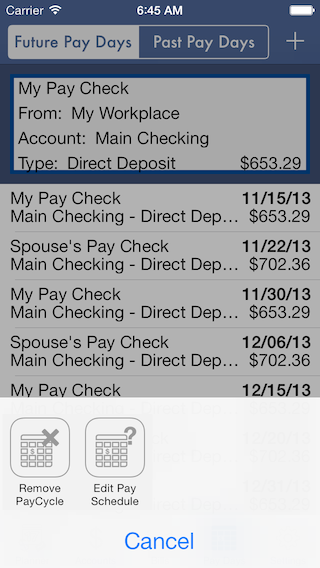 Money Pilot makes it just as easy to plan your finances for a multiple income household as it is for one. Below is the list of paydays throughout the end of the next coming year. Tap on one of the Pay Cycles and you'll be presented with options to edit the pay cycle or delete it and all it's pay days. To add a pay cycle just hit the "+" button in the Nav Bar, and you'll be presented with a choice of a week day based pay cycle or a fixed date style pay cycle. Choose one and you'll be presented with a form to set up the Pay Cycle. Fill in name for the Pay Cycle and choose whether Money Pilot should use it's pay days for bill planning or not. 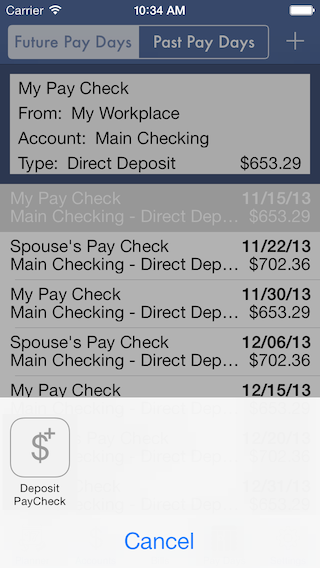 Next choose the account you deposit the pay checks into, and the Payment Type from the defaults or create your own. The next line on the form differs depending on which pay day style you've chosen. If you chose a weekday based Pay Cycle, you'll enter the date of your next pay day. 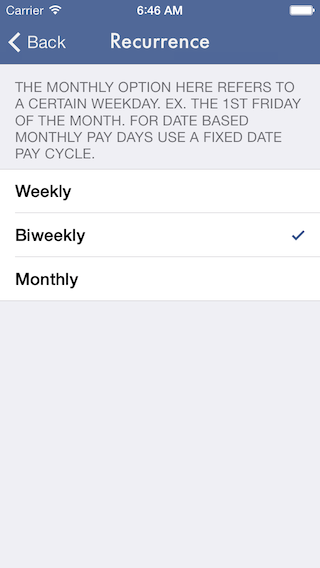 If you're creating a fixed date paycycle you'll tap the pay dates row and be presented with a view to determine the number of pay days per month and set the dates for them. Next enter the Payor Name of the employer and choose the expense category, most likely pay check, or create your own. Next enter the fixed amount or a rough estimate of what you expect the pay checks amount to be. Over time, as transactions are recorded for paydays, Money Pilot will re-average the amount of your paychecks so that it will become a more reliable estimate. Optionally add a URL if you're employer offers online access to view your pay day details. If you're making a week day based Pay Cycle you'll next pick the frequency of your pay checks. To make a deposit transaction record into your accounts just tap one of the pay days in the list and then tap "Deposit Pay Check". You'll be presented with the Transaction Editor prefilled in with the details for the pay day. Make any needed changes for the deposit and hit save. You'll then find the transaction recorded into the designated account. In the settings tab you'll find the Auto Pilot options. When enabled any pay day that is of Transaction Type "Direct Deposit", can have transactions created for you automatically when you open the app on or after the pay date. To delete a pay day just swipe it from the list.